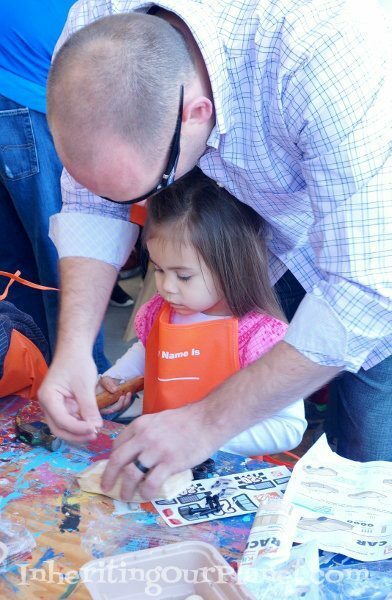 I didn’t realize that Home Depot offers FREE DIY workshops until recently. 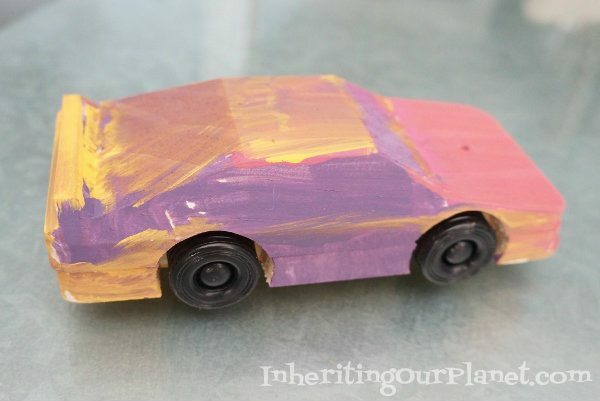 My husband and I signed my daughter up for a build a race car kid’s workshop this past weekend. She did not want to go but we enticed her with a hot dog after (she loves the hot dog truck that sits outside Home Depot!). We arrived promptly at 9:00 and there was already a line outside. 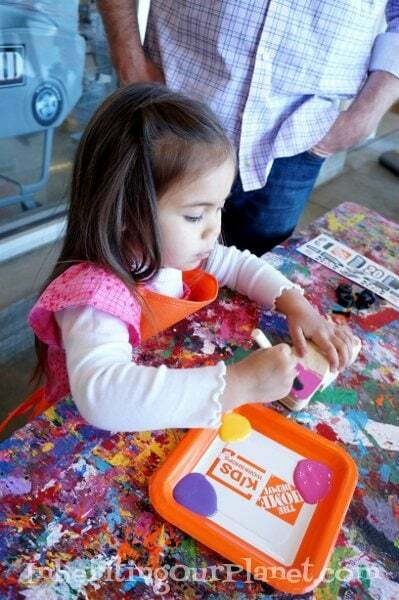 We signed in and they gave Mia a signature orange apron, the kit for the car and a badge pin for this workshop. There were two stations set up; one to build and the other to paint. The car was wooden and came in three pieces that needed to be nailed together. Her Dad helped her with the initial nailing, but she was able to hammer them in herself. She was so proud (and so was I). 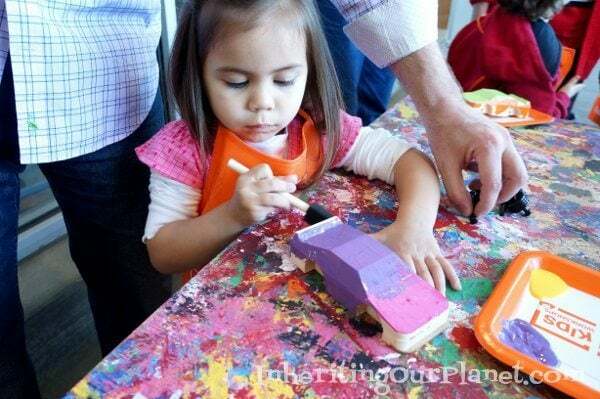 Before she added the wheels, we walked over to the paint table and she chose the colors she wanted, yellow, pink, and purple. She concentrated so hard while painting. It was adorable. By the time we left, there were several kids waiting to participate. I found out that the next one is the first Saturday of March and it’s a workshop on building a Trojan Horse Bank! We are definitely signing up! 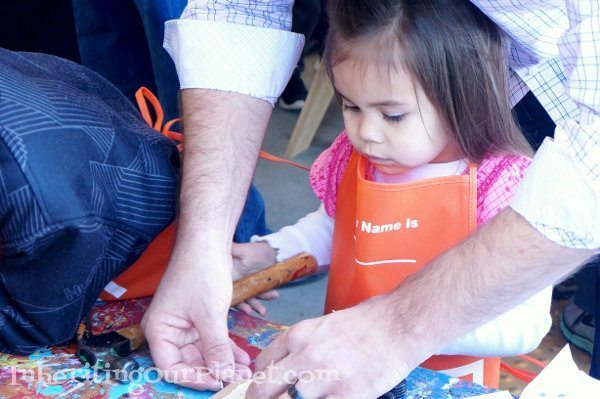 I looked online and they offer several free DIY workshops for both kids and adults. They even have a section for Do-It-Herself! Be sure to check out the Home Depot near you!